Beech trees in the southern hemisphere belong to the genus Nothofagus, and those of the northern hemisphere to a related genus –Fagus. Red beech, Nothofagus fusca (top), is the largest-leaved of New Zealand's four southern beech species. Its leaves are evergreen and about 3.5 by 2 centimetres in size, with three to five lateral veins either side of the midrib. European beech, Fagus sylvatica (bottom), is widely planted in New Zealand gardens. 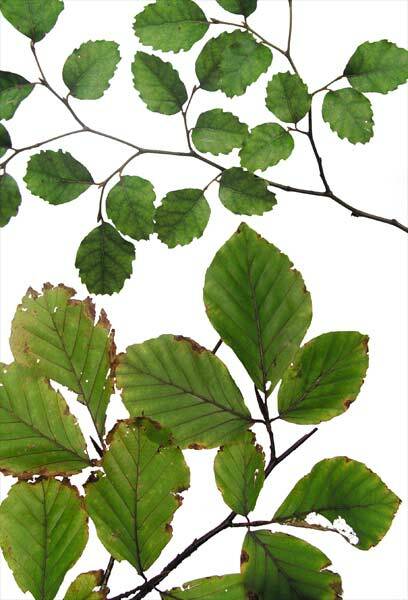 It is easily distinguished from native southern beech species by its deciduous habit and large leaves - up to 10 centimetres long and 7 centimetres wide.